Without a doubt, distinguishing between Original and Restrike 1851 and 1852 dollars is one of the pleasantries of numismatics. While the 1851 dollars are easily distinguished, those of 1852 are not so readily classified, as we will see below, where an 1852 dollar is offered. 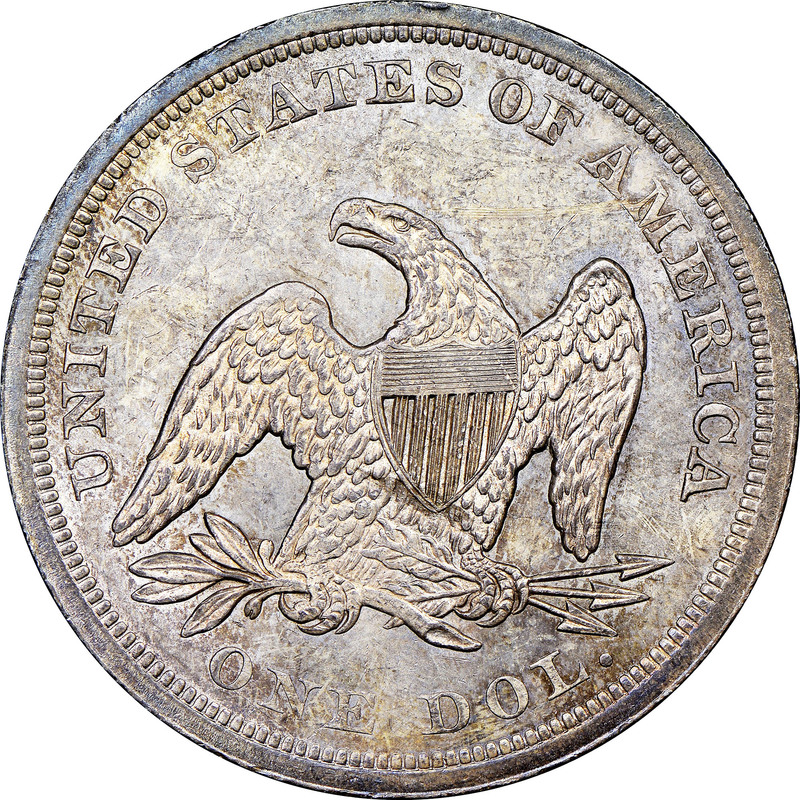 Nearly all known 1851 and 1852 Original silver dollars are in XF or AU grades, or they survive in low-end Mint State grades, suggesting that they did not readily circulate. 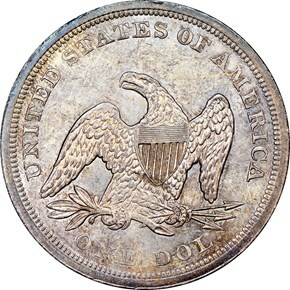 Mintages were also extremely small, just 1,300 in 1851 and 1,100 in 1852, according to Mint records. The reason for this was, of course, the California Gold Rush, with so many men from the eastern states scrambling to California by any means possible. 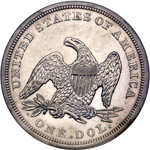 With the massive gold discoveries, silver became scarce by comparison, and the value of a silver dollar eventually rose above the face value of the coins. This explains the low mintages and the lack of circulation. Barely a decade later, with a greater number of coin collectors, the rarity of these issues was recognized, and certain members of the Mint staff began their own side business, creating Restrikes for collectors. Certainly, they could easily have explained that they were using these Restrikes to trade with others, for coins missing from the Mint's own cabinet. In reality, these 'midnight minters' as they have become known, were only interested in their own personal gain. 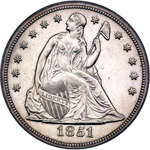 In 1851, the dies for the obverse of the silver dollar had the date high in the field, much closer to the rocky base of Liberty than to the border. Careful examination reveals the slightest recutting of the date, visible just below the serif of the first 1, outside the upper right curve of the 8, and at the very tip of the flag of the 5. A small unfinished area fills the space between Liberty's chin and her neck, and on this example, light clash marks are visible just below Liberty's arm in the field to the right. On the reverse, there is evidence of unfinished die work between the vertical shield stripes. These coins also have a die crack from the lower right curve of the O in ONE, angling down to the dentils below the right side of the N in ONE. Another die crack from the dentils near the wing tip below U, connects the tops of all letters in UNITED and continues to the dentils above the first S. These die cracks are also known on certain business strikes of 1850, meaning that the reverse die was used in both years, and virtually proving that these coins are the Original 1851 silver dollars. Of course, the 1851 Original silver dollars were produced in business strike format, with only a couple proofs alluded to by Walter Breen in his Complete Encyclopedia. A few years later, Dave Bowers noted that there were no Original proofs produced, and this is believed the case today. Those described in the past are now believed to be late die state coins, with prooflike surfaces created when the clash marks were removed from the die. 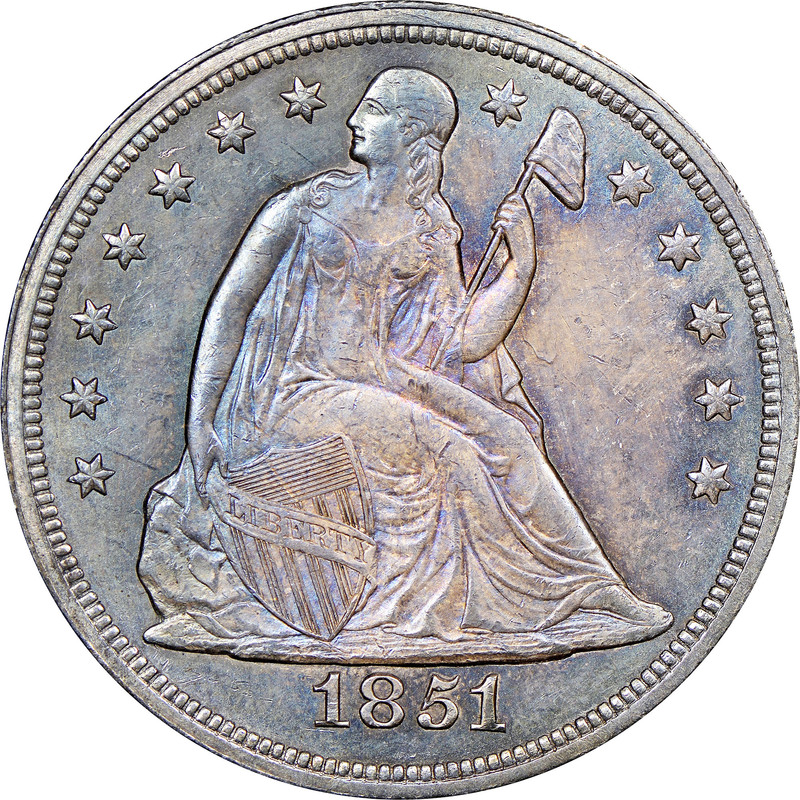 The 1851 Restrike silver dollars were believed coined in the late 1850s, and possibly also just after the Civil War. The Restrikes have the date centered in the field, lack the die cracks on the reverse, and exist only in Proof format. 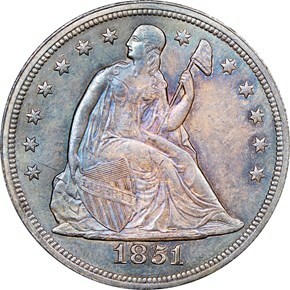 Two different die pairs are known for the 1851 Restrike dollars, and one of these has the same reverse die found on the 1852 Restrike dollars.